I just really like to walk. Pretty fast too, as most people who visit me can attest (sorry again dirtyzucchini and kriski!) So when I got linked to the flaneurs comm from snapshot_bingo it certainly sounded like the place for me. Except for the fact that my mental picture of flânerie involves parasols and Unter den Linden. Not quite my speed. But the general idea of wandering aimlessly or just for the sake of it appeals to me a great deal. This month was the time for a number of challenges in that comm. 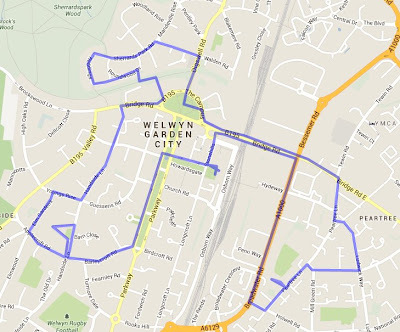 And so I ended up walking the official walks in Welwyn Garden City. Being a Garden City, Welwyn isn't that old. And apart from being a Garden City, there's not much about it that's interesting. But it's certainly pretty with lots of green. Start was at WGC railway station - which is hidden away in a shopping centre and has confused many non locals before. Then I walked along to Parkway and into one of the oldest residential areas. The model village was apparently built here as part of the ideal home exhibition. In addition to having lots of green areas, there's benches all over the place. And the occasional random chair. One of the oldest remaining cottages that predate WGC. Lots of parks and woodland in and around Welwyn. A pretty pompous bridge in my opinion, but apparently necessary for northward expansion over the (now disused) railway line in 1925. On the Campus. Welwyn Hatfield Council Offices in the old fire station building Most residential areas east of the railway line have been redeveloped in the 1990s. Those are just plain boring. Oldish area: Redeveloped area: A bit of the more industrial area east of the railway. All around Welwyn... All in all a pleasant, if relatively boring walk And now, back to not saying much at all. I'm actually trying to train for a tough mudder race in July. So much fun! comments on the original post. See http://ridicully.dreamwidth.org/259878.html to comment.